For all your landscaping materials needs – including garden soil, topsoil, compost, mulch and top dressing – you’ll love The Dirt Bag. We offer our products for bulk delivery and in convenient one cubic yard bags. We deliver directly to your location of choice and, for our bagged products, delivery is free for our Sandy, Utah customers. As a locally owned and operated company, we have built our reputation on providing exceptional quality products at budget-friendly prices. If you need larger quantities of landscaping materials delivered to your location in Sandy, The Dirt Bag has you covered. Choose from several sizes, colors and types of gravel as well as screened topsoil, garden soil, mulch, compost, play sand, shredded bark, Utelite soil conditioner and playground wood chips. Each page of our secure and easy-to-use website has a handy landscape materials calculator, so you can quickly determine how much of each material you need. Then just pick up the phone and make a quick call to The Dirt Bag. In just a minute or two, you’ll be set for your delivery. Our signature products are available in durable and reusable one cubic yard bags and, for our customers in Sandy and throughout Salt Lake County, we will deliver to you for free. 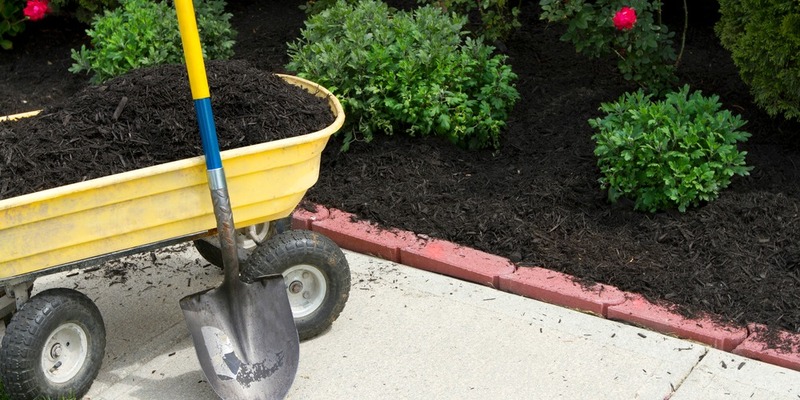 For our bagged landscaping materials, you can select our best-selling product, Garden Soil Plus, along with mulch (black and dark brown), shredded bark mulch, Utelite soil conditioner, organic mountain compost, wood chips, play sand and screened topsoil. Place your bagged materials order online or over the phone and we’ll do the rest. Choose your specific delivery location and mark it with an “X” on the ground and that’s where we’ll drop your Dirt Bags! The Dirt Bag offers our northern Utah native Kentucky Bluegrass hybrid sod for delivery to customers in Sandy. This eco-friendly turfgrass is grown and harvested locally and delivered fresh to your door in 2’ x 5’ rolls, stacked on convenient pallets. Once you lay the sod, you will be delighted at how little water and care it needs to provide a lush, green lawn throughout the growing season. We sell our Utah sod with a minimum order of four pallets, or approximately 2160 square feet. We will deliver it to you for a nominal delivery fee or, if you order 10,000 square feet or more of sod, we will waive your delivery charge. The Dirt Bag is northern Utah’s go-to choice for landscape materials delivery in Sandy. Our high-quality products provide everything you need to complete your landscape and gardening projects without busting the budget. Our friendly, helpful staff is dedicated to providing an exceptional customer service experience. Contact us today to arrange for your delivery of landscaping materials, topsoil, compost, mulch and top dressing in Sandy, Utah.